The quality and quantity of cultural landscapes that feature characteristic natural elements face incredible pressures throughout Europe, and particularly in north-western Europe. The problem is evident on three levels. In the first place, many elements have simply disappeared. Trees have been felled, land put under the plough, or waterways drained. Secondly, the corridors once linking the various elements have been significantly reduced. Increasingly, landscape features no longer form a continuous network. Thirdly, the quality of the features themselves has deteriorated. Widespread serious neglect and poor maintenance have led to decreased variation and have brought less vitality to natural features. Visiting the ‘fototheque’ of the Ministry of Agricultural Affairs in Paris, we were shown an archive of old images of large scale land consolidation programs. These showed groups of men bent over a map pointing and shifting parcels, young men driving bulldozers entering the ‘bocage landscape’, and the aerial pictures of before and after. If you fly across Europe and look downwards, you can still see the results: a dense network of white stripes on just-ploughed arable fields. These are the remains of our former cultural landscape, written in our soil. In other areas, micro-relief from ridges in the fields reveals the unbelievably small-scale character of yesteryear’s cultural landscapes. With Google Earth able to display old and new images seamlessly, we can see some painful showcases of areas, which in a 5 year time-lap, show the disappearance of hedges from a landscape in a split screen. 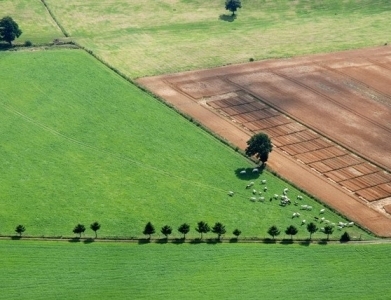 Last year, Georg Müller published an impressive standard about cultural landscapes called ‘Europe’s field boundaries’. It took him years of writing and travelling to summarize his fieldwork in thirteen hundred pages containing highly detailed descriptions of sites and management practices for hedged banks; hedgerows; field walls; dent brushwood; woven and bent hedges; wattle fences, and traditional wooden fences all over Europe. It shows not only differences, but also many similarities in land use and management practices. Our book ‘Beautiful Europe’, and leaflet ‘Is it too late to save Europe’s beauty?’, takes you on a journey through some of the most beautiful cultural landscapes in north-western Europe. The intricately interconnected cultural landscapes, in which countless species were able to move about freely in the past, have largely been forced back to the far corners of Europe, or are preserved in national parks or conservations areas. The last unspoiled vestiges of our countryside are thus becoming ‘locked in’. We need to cherish and protect these important cultural landscapes and the philosophy of using edges of fields to connect natural elements. This is not only because of their inestimable heritage value – many landscape features have been in place for centuries - but in particular, because they can serve as a source of inspiration for large scale improvements to European agricultural monocultures, so often seen nowadays. And, all the more so now since, posed on the eve of major climate change, our flora and fauna are being forced to adapt. Greening the CAP is about leaving the reserves and parks we have created for them and finding a way to provide further suitable habitats in our agricultural landscapes. The CAP greening architecture made sense on paper. ‘Greening’ is a policy buzz word and yes, represents a historical change, with 30% of Direct Payments allocated to ‘environmental measures’ and a 30% minimum of Pillar 2 spending. Many presentations given by EU representatives about greening the CAP draw on triangular logic: cumulative environmental benefits for all agricultural area eligible for direct payments. The baseline of the triangle is cross compliance with statutory management requirements and good agricultural environmental conditions (GAEC). The second stage of the triangle is a mandatory decoupled green payment per hectare with financial support. The third stage is rural development, including agricultural environmental condition measures, with compensation for costs incurred and income forgone. GAEC standards aim to contribute to ensure a minimum level of maintenance and avoid the deterioration of habitats. But, they can also protect our landscape features. Member states have to adopt national GAEC standards to better address biodiversity and landscape issues as well as minimum level of maintenance of the land. Statutory management requirements need to be fully implemented by Member States in order to become operational at farm level and ensure equal treatment of farmers. So, there is a strong obliged connection between farming, landscape features and creating habitats for biodiversity. GAEC 1 requires establishment of buffer strips along water courses. But, where are they? GAEC 5 requires minimum land management reflecting site specific conditions to limit erosion. So, why are (former) terraces on farmland still ploughed away or trampled by cattle? GAEC 7 describes landscape and a minimum level of maintenance. It requires retention of landscape features such as hedges; ponds; ditches; trees in line, in group or isolated; field margins, and terraces. It includes a ban on cutting hedges and trees during the bird breeding and rearing season. Hedges are vital for the conservation of biodiversity in agricultural landscapes. In many ways our hedgerows resemble woodland edges. Both are rich in wildlife and contain similar scrubby species. But, many hedgerows on farmland suffer and are either over-managed or neglected. Typically, over-managed hedgerows have been cut at the same height for so long and so many times that gaps have appeared and the stems have become gnarled and twisted. Apparently, there is no common understanding of the definition of a hedge in GAEC7, while the Oxford dictionary defines a hedge clearly as ‘a row of bushes or small trees planted close together, usually along the edge of a field’. In the end, it is not just the failure of the greening of the CAP that is a pity. It is the failure of losing the whole described greening triangle. It is the failure of losing our cultural landscape that defines Europe. Field boundaries are the most important letters of our landscape.